The EnviroOne Capacity Building project is a multi-fold process. First, we strive to understand the obstacles that have prevented the people and the communities we intend to serve from realizing their development goals. We do that by engaging all the stakeholders (women, farmers, teachers, petty traders, and even children) in each community by holding community meetings. We also review existing reports on previous development efforts. From these meetings and reports, we were able to get a thorough understanding of the knowledge-base of the stakeholders, their financial capabilities, existing leadership, institutional opportunities (if any), and accountability measures. 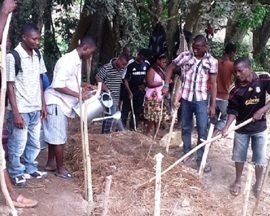 Formal education and extension services: EnviroOne instructors provide training on modern agricultural techniques, and the operational and financial aspects of farm management including the use of modern technologies (smart phones, computers) to access farm information. Our agronomists then followup with extension services to farmers on a periodic basis which has proven to be a key component in the success of our programs. We also provide training to women in organic vegetable gardening, processing and marketing, and the successful use of micro-loans. The results of our training programs have been impressive. We see petty traders opening new shops. Also evidenced is farmers increasing crop yields with less use of chemical fertilizers and pesticides. There is also an increased interest by farmers in purchasing greenhouses, and better crop processing and farm management including improved crop transportation to market places.